If you’re looking something to take the edge off of chilly nights out at the fire but don’t want to commit to a full-on sweater, here’s a great free knitting pattern for a neck scarf from the great folks over at NobleKnits! 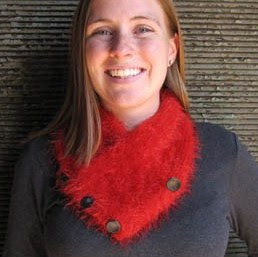 This pretty neck scarf knitting pattern is created using Universal’s Chic Fleece supersoft eyelash yarn. It’s a quick and easy knitting pattern from our friends at Universal Yarn.